CBS affiliate WTVR in Richmond, Virginia, has “signed on” to research for her! In an interview aired August 6 at 5 p.m. and 11 p.m., the station reported on the lack of participation by women in clinical research. The interview highlights that physicians in the greater Richmond area have begun referring their female patients to participate in research for her, an innovative program sponsored by the Cedars-Sinai Women’s Cancer Program. The segment focused on the need to bring more women into research. Cedars-Sinai’s research for her program helps raise awareness about this important issue and aims to inspire all women – regardless of cancer diagnosis – to register to participate in appropriate clinical trials. Viewers were encouraged to link to the research for her website to learn more about the program. Watch the segment. This work to bring more women into research continues to spread across the country. The longer term ramifications of this effort will help us improve care for women and bring better, facilitating more effective options for care and screening. To find out more about research for her click here. Dr. Rimel is a gynecologic oncologist and faculty physician with the Cedars-Sinai Women’s Cancer Program at the Samuel Oschin Comprehensive Cancer Institute. She is the Principle Investigator for the Program’s clinical trials. 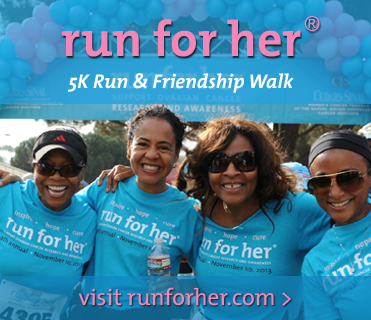 Run for Her® Goes Virtual and Global: What This Means for You! Hereditary Cancer – Are You At Risk?